Her opponents are men - thieves and assassins and warriors from across the empire, each sponsored by a member of the king's council. If she beats her opponents in a series of eliminations, she'll serve the kingdom for four years and then be granted her freedom. Celaena finds her training sessions with the captain of the guard, Westfall, challenging and exhilirating. But she's bored stiff by court life. Things get a little more interesting when the prince starts to show interest in her... but it's the gruff Captain Westfall who seems to understand her best. 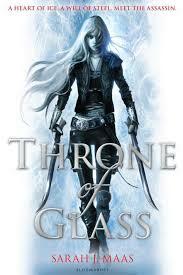 I first read Throne of Glass back in 2014 (see my review here). While I enjoyed it enough to continue on with the series, there were some areas with the first book, particularly with regards to the protagonist, that I wished were a bit better developed. Naturally, those issues melted away with the sequel, Crown of Midnight, and I was by then deeply engrossed with the series. Two years have passed and my memories of the series have faded quite a bit. So I decided to read The Assassin’s Blade, the anthology of four prequel novellas, first prior to rereading the series from the start (and then catching up with the rest of the series). I must admit, coming back to this novel (with the knowledge of the prequel), my experiences have somewhat changed. Firstly, my understanding of Calaena and her background story is a lot more fleshed out and I feel that definitively helped me enjoy the re-read a lot more. Names and places that were, on the first read, merely mentions that I did not really understand, are now more full of meaning and implications. I am able to appreciate them and how they have impacted on Calaena. My main issue with Throne of Glass still persists. The competition to become the King’s Champion was the main story arc of this first novel, with hints of something big brewing scattered throughout. However, the competition was rarely described in great detail. Perhaps I am being too judgemental because I am reviewing this having read subsequent instalments where oh my goodness, there is so much happening! But I think a bit more action and plot advancement could have turned Throne of Glass from a solid first novel of a series into an amazing book in its own right. Overall, I think I enjoyed the re-read a bit more. There are elements of the story I appreciated this time around which I had missed on my initial read. While I think this remains the weakest book of the series (not because it’s weak but because later books are amazing! ), I am still upgrading my rating to a solid 4 stars and recommending this series to everyone who loves YA fantasy!